Geotextile is permeable flexible membrane a fabric like continues sheet of woven / non woven. 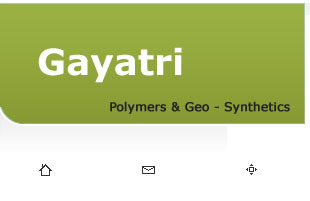 Woven: - polypropylene multifilament woven goetextile are manufactured from high tenacity multifilament yarn. Non woven: - polypropylene non woven geotextile are manufactured form specialty fibers chemically / mechanically or thermally bonded process and is needle punch. Separation function; separation of two layers of soil with different soil physical properties, such as road gravel from soft sub-base materials. Filtration function; retaining fine particles when water passes from a fine-grained to a coarse grained layer, such as when water flows from a sandy soil into a geotextile wrapped gravel drain. Drainage function; to drain liquid or gas in the plane of the fabric which results in draining or venting of the soil, such as a gas vent layer in a landfill cap. Reinforcement function; improving the load bearing capacity of a soil structure, such as a high strength geotextile to reinforce a retaining wall. Protection function; mechanical protection of geomembranes against perforation and abrasion, such as a liner protective layer when only gravel fills are available.